Unofficial leaked images of the upcoming 2012 Toyota Tacoma surface on the web. 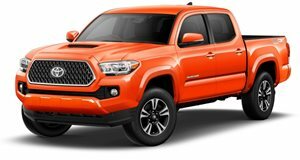 Toyota is planning to unveil their refreshed Tacoma in the coming months, but now some unofficial images of the new model, thanks to the guys at PickupTrucks.com, have surfaced on the web. We can now see the first details of the lightly restyled front-end, which has taken cues from the 4Runner. The Tacoma&apos;s facelift will also incorporate the automaker&apos;s latest infotainment technology called Entune, which is a Ford SYNC-like system that allows drivers to control their smartphones through dash or voice controls. The system is also planned for the Prius V wagon. However, the main goal is for the automaker to continue attracting a younger generation of compact pickup drivers. And now that Ford will no longer be selling the Ranger in the U.S, it&apos;s vital for Toyota to reach out to those buyers. The interior alone is a huge upgrade that should appeal to younger truck enthusiasts. It&apos;s rumored that an official on sale date is set for October. Additionally, it will be built in Mexico and not Fremont, California because that facility was sold last year to Tesla, where they will build the upcoming Model S. Toyota is still mum to confirm the photos, but we&apos;ll take that as a quiet yes from them.